TED Talk - Robin Ince: Science versus wonder? Warren Buffett’s Berkshire Hathaway Inc. will expand its media holdings by acquiring the Omaha World-Herald Co., publisher of the billionaire’s hometown newspaper. The World-Herald reported the price as $150 million plus assumption of debt. The deal would give Berkshire control of the World-Herald, six other daily newspapers and several weekly newspapers across Nebraska and southwest Iowa, according to a company statement today. Sellers include employee shareholders and the Peter Kiewit Foundation. Buffett is putting aside his doubts about the industry after telling shareholders in 2009 that papers have “potential for unending losses” and that he wouldn’t buy most of them “at any price.” Publishers have lost revenue as readers shift to other media including the Internet. In addition to the $150 million cash purchase, Berkshire will take on $50 million of World-Herald debt, the newspaper reported. Buffett didn’t respond to an interview request e- mailed to Berkshire’s Omaha headquarters. Steven Pinker was a 15-year-old anarchist. He didn’t think people needed a police force to keep the peace. Governments caused the very problems they were supposed to solve. This was in Montreal, “a city that prided itself on civility and low rates of crime,” he said. Then, on Oct. 17, 1969, police officers and firefighters went on strike, and he had a chance to test his first hypothesis about human nature. The ’60s changed the lives of many people and, in Dr. Pinker’s case, left him deeply curious about how humans work. That curiosity turned into a career as a leading expert on language, and then as a leading advocate of evolutionary psychology. In a series of best-selling books, he has argued that our mental faculties — from emotions to decision-making to visual cognition — were forged by natural selection. He has also become a withering critic of those who would deny the deep marks of evolution on our minds — social engineers who believe they can remake children as they wish, modernist architects who believe they can rebuild cities as utopias. Even in the 21st century, Dr. Pinker argues, we ignore our evolved brains at our own peril. Given this track record, Dr. Pinker’s newest book, published in October, struck some critics as a jackknife turn. In “The Better Angels of Our Nature” (Viking), he investigates one of the most primal aspects of life: violence. Now, amid tumbling home prices and near-record foreclosures, attention was focused on a new source of contagion: Fannie Mae (FNMA) and Freddie Mac, which together had more than $5 trillion in mortgage-backed securities and other debt outstanding, Bloomberg Markets reports in its January issue. Paulson had been pushing a plan in Congress to open lines of credit to the two struggling firms and to grant authority for the Treasury Department to buy equity in them. Yet he had told reporters on July 13 that the firms must remain shareholder owned and had testified at a Senate hearing two days later that giving the government new power to intervene made actual intervention improbable. “If you have a bazooka, and people know you have it, you’re not likely to take it out,” he said. On the morning of July 21, before the Eton Park meeting, Paulson had spoken to New York Times reporters and editors, according to his Treasury Department schedule. A Times article the next day said the Federal Reserve and the Office of the Comptroller of the Currency were inspecting Fannie and Freddie’s books and cited Paulson as saying he expected their examination would give a signal of confidence to the markets. At the Eton Park meeting, he sent a different message, according to a fund manager who attended. Over sandwiches and pasta salad, he delivered that information to a group of men capable of profiting from any disclosure. After a perfunctory discussion of the market turmoil, the fund manager says, the discussion turned to Fannie Mae and Freddie Mac. Paulson said he had erred by not punishing Bear Stearns shareholders more severely. The secretary, then 62, went on to describe a possible scenario for placing Fannie and Freddie into “conservatorship” -- a government seizure designed to allow the firms to continue operations despite heavy losses in the mortgage markets. Paulson explained that under this scenario, the common stock of the two government-sponsored enterprises, or GSEs, would be effectively wiped out. So too would the various classes of preferred stock, he said. The fund manager says he was shocked that Paulson would furnish such specific information -- to his mind, leaving little doubt that the Treasury Department would carry out the plan. The managers attending the meeting were thus given a choice opportunity to trade on that information. There’s no evidence that they did so after the meeting; tracking firm-specific short stock sales isn’t possible using public documents. Euroland’s problems are global and secular in nature, reflecting worldwide delevering and growth dynamics that began in 2008. It will be years before Euroland, the United States, Japan and developed nations in total can constructively escape from their straitjacket of high debt and low growth. If so, then global growth will remain stunted, interest rates artificially low and the investor class continually disenchanted with returns that fail to match expectations. If you can get long-term returns of 5% from either stocks or bonds, you should consider yourself or your portfolio in the upper echelon of competitors. In 2002, Daniel Kahneman won the Nobel in economic science. What made this unusual — indeed, unique in the history of the prize — is that Kahneman is a psychologist. Specifically, he is one-half of a pair of psychologists who, beginning in the early 1970s, set out to dismantle an entity long dear to economic theorists: that arch-rational decision maker known as Homo economicus. The other half of the dismantling duo, Amos Tversky, died in 1996 at the age of 59. Had Tversky lived, he would certainly have shared the Nobel with Kahneman, his longtime collaborator and dear friend. For companies, these are boom times. For workers, the opposite is true. The chart below was found via Zero Hedge. The related paper from the Bank for International Settlements is available HERE. 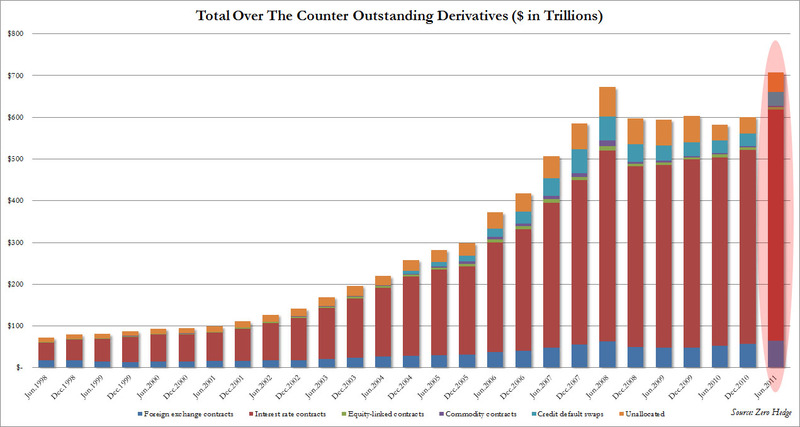 Notice how much the derivatives market has grown since Buffett made the above statement. Angela Merkel is leading the call for a rule change, a rewiring of the basic treaty that binds the EU. But is it both too much and too late? The market action suggests that time is indeed running out, and so we’ll look at the likely consequences. Then I glance over the other way and take notice of news out of China that may be of import. Hussman Weekly Market Comment: Are Corporate Balance Sheets Really the Strongest in History? It is freely accepted by investors as fact that U.S. corporate balance sheets are the stronger than ever before in history. This view is largely driven by the significant amount of cash (checking deposits, savings deposits, money market funds, commercial paper holdings) on corporate balance sheets. Our difficulty with this view is that no single line item on a balance sheet is a sufficient indication of "strength." Most useful measures are derived from ratios at the very least, and ideally calculations across a variety of dimensions. The best line item on corporate balance sheets today is typically "Cash and Equivalents." But while the amount of cash and cash-equivalents on U.S. (nonfinancial) corporate balance sheets has increased significantly, particularly relative to the cash-strapped lows of 2009, corporate cash is certainly nowhere near historical highs relative to debt. As a side note, probably the dumbest use of balance sheet data that we hear from time-to-time is when analysts talk about the P/E multiple of a stock "after you back out the cash," as if the cash line item can meaningfully be subtracted from the market cap of the equity. Really? If a company issues a billion dollars of debt, and then holds the proceeds in cash, does that suddenly make the stock "cheaper" because we can now back out that cash from the company's market cap? Um, no. While cash holdings are relatively high compared with total assets and net worth, even those figures are in the range of 5-10%, only about 3 percentage points above historical norms. Cash levels are "high" in the sense of being a larger percentage of total assets than normal, but the "excess" cash amounts to roughly $700 billion, versus total assets of non-financial corporations of about $28.6 trillion. The excess is fairly second-order from the standpoint of overall balance sheet "health." The best that can be said is that corporations are fairly liquid here, but this is a much different statement than saying that corporate balance sheets have "never been healthier in history." In evaluating overall balance-sheet health, it is important to consider the overall debt burden of corporations. As the following chart shows (based on Federal Reserve Flow of Funds data), the debt burden of U.S. corporations is near all-time highs, having retreated only modestly since 2009. Debt burdens are elevated regardless of whether they are measured against total assets or net worth. Certainly, corporations are presently benefiting from very low interest rates on corporate debt, which substantially reduces the servicing burden of these obligations. But the combination of high debt levels and low servicing burdens does create a potential risk to corporate health in the event that yields rise in future years. Overall, the picture is fairly stable at present thanks to low yields and high levels of cash-equivalents, but it is important for investors to keep in mind that cash can burn fairly quickly during economic downturns, and debt is not spread evenly across corporations. The bottom line is that at an aggregate level, corporate balance sheets look reasonable, but are certainly not "stronger than they have ever been in history." Cash levels are elevated, but this is at best a second-order factor (with excess cash representing only a few percent of total assets), while debt remains near record levels relative to total assets and net worth. In any event, balance sheet risks should be evaluated on a business-by-business level, rather than accepting the blanket notion that cash levels are so high that nobody needs to worry about corporate credit risk. And if you haven't seen the 60 Minutes segment showing that members of Congress are legally allowed to trade on previously non-public information like this, here's a link to it: Congress: Trading stock on inside information? Michael Bloomberg, mayor of New York, does not often hide his views. When he recently addressed an international economic forum at Columbia University, on the seemingly “dull” topic of science and politicians, however, his words were incendiary, even by his standards. It is a comment that many observers might echo, particularly among the ranks of American scientists. For while Bloomberg did not specify whom he considers to be “mind-boggling”, the list of targets is long. Thus far, just three of the eight potential Republican candidates have positively declared that they believe in the scientific basis for evolution. The rest have either hedged, or – like Rick Perry – claimed that evolution is just “a theory that is out there... [but] it’s got some gaps in it”. Meanwhile, Michele Bachmann, another contender, has actively called for creationism to be taught too, since she has similar doubts about the evolutionary science. Newt Gingrich has cast doubt on the virtues of stem cell research, Herman Cain has questioned whether there is any scientific evidence behind homosexuality, and most of the candidates have queried climate change. Indeed, whenever any candidate has defended evidence-based science, they have suffered a backlash: witness the travails of Mitt Romney. I submitted an article to Seeking Alpha. Below is a link to it. Thanks to Andrew for pointing this show out to me. Nov. 22 (Bloomberg) -- Bill Gross, co-chief investment officer at Pacific Investment Management Co., and Laurence Fink, chief executive officer of BlackRock Inc., discuss the European sovereign-debt crisis, the U.S. economy and investment strategy. Bloomberg's Erik Schatzker moderated the Nov. 17 event hosted by the UCLA Anderson School of Management and Bloomberg Television. Nov. 23 (Bloomberg) -- Jim Chanos, founder of Kynikos Associates Ltd., talks about banking in the U.S. and China, investment strategy and the risk of a U.S. recession. Chanos, speaking with Betty Liu on Bloomberg Television's "In the Loop," also talks about equity markets and the congressional deficit-cutting supercommittee's failure to reach an agreement. In “The Drunkard’s Walk”, Caltech physicist Leonard Mlodinow’s book about how people misunderstand the amount of randomness in their lives, there’s a short but fascinating passage discussing Bill Miller’s 15-year streak, beginning in 1991, of beating the S&P 500. Mlodinow’s book is what first came to mind when we heard the news last week that Miller was stepping down from the Legg Mason Value Trust fund, which he’d managed for thirty years. In the five years since the streak ended, Miller’s fund lost 9 per cent annually and ranked dead last out of the 840 funds in its category, according to Lipper. Predictably, most of the commentary we’ve seen has focussed on his spectacular crash after his equally spectacular run. The obvious reason most people considered the streak so extraordinary — and Miller to be such an impressive stock-picker — was that the odds of any single mutual fund generating such a run were so infinitesimally small. Perhaps luck could account for a few good bets or a couple of good years, the thinking went, but surely it couldn’t account for such extraordinary and sustained outperformance. A newsletter published by Credit Suisse-First Boston in 2003, a few years before the streak ended, calculated the odds of a manager outperforming the market on chance alone for 12 straight years to be one in 2.2 billion. But what if Miller’s streak wasn’t so remarkable to begin with? The statisticians like those from CSFB were considering the odds that a specific fund would outperform for 12 straight years if the fund begins investing at a specific time. But as Mlodinow explained, maybe the better question to ask is actually this: given the number of mutual funds that have existed in the modern era, what are the odds that any of them would have beaten the market over any 15-year period of time on chance alone? Answer: 3 out of 4. Albert Edwards: Were the US & UK central banks complicit in robbing the middle classes? Ben Bernanke’s recent speech at the American Economic Association made me feel sick. Like Alan Greenspan, he is still in denial. The pigmies that populate the political and monetary elites prefer to genuflect to the court of public opinion in a pathetic attempt to deflect blame from their own gross and unforgivable incompetence. The US and UK have seen a huge rise in inequality over the last two decades, as growth in national income has been diverted almost exclusively to the top income earners (see chart below). The middle classes have seen median real incomes stagnate over that period and, as a consequence, corporate margins and profits have boomed. Some recent reading has got me thinking as to whether the US and UK central banks were actively complicit in an aggressive re-distributive policy benefiting the very rich. Indeed, it has been amazing how little political backlash there has been against the stagnation of ordinary people’s earnings in the US and UK. Did central banks, in creating housing bubbles, help distract middle class attention from this re-distributive policy by allowing them to keep consuming via equity extraction? Hugh Hendry, Eclectica Asset Management and Steven Drobny, Drobny Global Advisors from LSE SU AIC on Vimeo. It’s fair to say that our discussion about the big lie touched a nerve. The big lie of the financial crisis, of course, is that troubling technique used to try to change the narrative history and shift blame from the bad ideas and terrible policies that created it. Based on the scores of comments, people are clearly interested in understanding the causes of the economic disaster. I want to move beyond what I call “the squishy narrative” — an imprecise, sloppy way to think about the world — toward a more rigorous form of analysis. Unlike other disciplines, economics looks at actual consequences in terms of real dollars. So let’s follow the money and see what the data reveal about the causes of the collapse. Nov. 21 (Bloomberg) -- Warren Buffett, chairman and chief executive officer of Berkshire Hathaway Inc., talks about the hunt for his next acquisition and the price he would be willing to pay. Buffett, speaking with Bloomberg's Tomoko Yamazaki in Fukushima prefecture in northern Japan, also discusses the U.S economy and Japanese investment opportunities. Taubes also posted the third part in his latest series of blog posts HERE (for the first two parts, go HERE and HERE). Gary Taubes, author of Good Calories, Bad Calories, talks to EconTalk host Russ Roberts about what we know about the relationship between diet and disease. Taubes argues that for decades, doctors, the medical establishment, and government agencies encouraged Americans to reduce fat in their diet and increase carbohydrates in order to reduce heart disease. Taubes argues that the evidence for the connection between fat in the diet and heart disease was weak yet the consensus in favor of low-fat diets remained strong. Casual evidence (such as low heart disease rates among populations with little fat in their diet) ignores the possibilities that other factors such as low sugar consumption may explain the relationship. Underlying the conversation is a theme that causation can be difficult to establish in complex systems such as the human body and the economy. The European: The classical economic point of view is that peoples’ decisions results from a careful weighing of what will create the most desirable result. What do you advocate? Schwartz: Well, I think this picture is completely false, but I think that even economists have known it was false almost from the start. Arguably the leading economist from the 20th century, Keynes, wrote about animal spirits. So here’s this framework of rational, utility-maximizing choice, and along comes Keynes and there’s this package of stuff that he calls animal spirit, that we just might call psychology, that has an enormous influence, moderates, completely negates all these processes of rational deliberation that economist models are built on. So this has been the dirty secret of economics forever. They build models as if people are rational actors, knowing that that assumption is unjustified. And what they hope, I think, and what Keynes thought was also a mistake, is that our irrational quirks are idiosyncratic, so that they basically just cancel each other out. Since economists are not particularly interested in predicting what you will do, or what I will do, but rather what whole markets will do, quirkiness doesn’t matter if it’s random. What Keynes appreciated is that it’s not random. In fact, bubbles are the opposite of random. Every time one of these bubbles pops, it seems to me, it’s a real thorn in the side of the kind of models of rational choice that economists build. Europe is again at center stage. At conferences and meetings and in private conversations, it is the topic of the hour. I have thought a lot this week about Europe and its impact, so once again we delve into what is an evolving situation. This time, we look at possible impacts on the markets, as we ponder the questions, “Are we back to 2008?” and “Is there a Lehman in our future?” and I try once again to keep from making this a book-length letter. And I close with some brief thoughts I brought back from DC on the Super Committee and the deficit cuts. Here's something to think about. When we look at any stream of payments, the value is based on the whole long-term stream, not just the benefits received in the first few years. Those of you that are familiar with the dividend discount model, for example, know that the bulk of the "value" of a stock is not in the near-term cash flows the stock will throw off in the first few years, but in the very long-term "tail" of those cash flows (or equivalently, the terminal value expected in a buyout). Well, the same is true for a currency. Even if the Federal Reserve creates a massive amount of currency, it will not be inflationary provided people are absolutely convinced that the dollars will only hang around for a short period of time. If they ever become convinced that the new dollars are permanent (and especially if there is not an ongoing credit crisis to create safe-haven demand), the marginal value of each individual dollar would decline, and inflationary pressures would emerge. From this perspective, it should be clear why the Federal Reserve's tripling of its balance sheet has not resulted in near-term inflation. There is significant demand for the U.S. dollar as a safe-haven currency, the creation of dollars is still viewed as temporary, even though the Treasury is still bailing out Fannie and Freddie in order to make the mortgage securities held by the Fed whole. The problem for the Fed will emerge in the back half of this decade if (and I suspect when) it becomes clear that there is no easy way for the Fed to disgorge its balance sheet without causing disruptions in an economy where the U.S. debt/GDP ratio will then be well above 100%. At that point, the dollars that the Fed has created may be looked upon as more permanent than the markets bargained for, and we are likely to see inflationary pressures. For now, however, we continue to expect only modest near-term inflationary effects from the Fed's actions, despite being reckless and misguided in a broader sense. Against this backdrop, consider a situation where the European Central Bank begins to print new euros in order to purchase the debt of distressed European countries that are deeply indebted and likely to become more so (barring a major restructuring of their existing obligations). In this case, would people be likely to view the newly created euros as temporary or permanent? Would people be likely to seek the euro as a "safe haven," or would they seek the relative safety of some other currency? For my part, I am convinced that a move to buy distressed European debt by creating euros would be seen as permanent money creation, and that far from seeing any safe-haven demand for euros, we would instead see a flight from the euro. As a result, European inflation would predictably accelerate. The bottom line is this, the call for massive ECB purchases of distressed European sovereign debt is not simply a call for a liquidity-providing intervention, but is an attempt to address a solvency issue. Liquidity issues can often be addressed through temporary increases in the stock of money, but to address solvency issues, you have to print permanent money. A memorable instance of permanent money creation as a means of financing budget deficits was in 1922, when Germany (saddled with war reparation obligations that violated the no-Ponzi condition, and responding to an invasion of the Ruhr by France and Belgium), began printing money in order to keep paying striking workers in the Ruhr even though they were not producing goods and services. The shift to printing money triggered an immediate flight away from the German mark. The resulting hyperinflation is well-remembered by the German people even if the rest of the world has forgotten. There are strong legal restrictions among the EU nations against solvency operations by the ECB, and even if one believes that this is inevitable, the chance of the ECB deciding to abandon EU Treaties on its own is zero, in my view. The main thing to look for, if the ECB is to expand its purchases of distressed European debt, would be a solid effort to impose centralized control on the fiscal policies of the individual European member states. This will be a painstaking process, subject to unanimous approval by EU member states. But I strongly doubt that we will see significant ECB intervention without a formal revision of EU treaties that trades greater ECB flexibility in return for more centralized fiscal control. And here enters a wistful historical counterfactual: how different might history have been if the Germans had inflated their economy when the crisis broke? It's impossible to say, of course. By 1931 the world was in depression. Germany would have been too, with or without its pathological fear of inflation. The Nazis would presumably have made the same electoral gains. But suppose Germany had inflated in 1931, like the U.K. did. The following chart compares the trajectory of the U.K. unemployment rate after it had left the gold standard with that of Germany, who stayed on. After leaving the gold standard, the U.K. saw its unemployment rate decline by about a third from 1931 to 1933, while Germany's rose significantly over the same period. If Germany had been willing to follow the U.K. in inflating, and its unemployment rate had followed a similar trajectory, it would have stood at 17% rather than 33%. Would this have averted what followed? Would Hitler have won that March 1933 election with 45% of the vote? Would the world have experienced the evils of the Nazis in power? World history might have been very different. There might not even be a euro today, let alone a euro crisis. So even a hard money libertarian like me can see that there have been times in history when creating inflation would have been the right thing to do. Germany today has to decide if now is one of those times. Europe's crisis today is orders of magnitude smaller than that in the early 1930s. The stakes are much lower today than they were then. But they are not low. And, just as it might have done in the 1930s, flexibility on hard money principles might help turn the tide. ECB involvement cannot solve the underlying problems of the eurozone economies, which are anti- entrepreneurial and too heavily regulated. But it will buy time with which to address these problems and so allow eurozone policy makers to get ahead of the panic for now. As we have warned for months, the current environment is very similar to 2008. In August 2007 the global financial system collapsed and the global economy was in contraction. But stocks kept rallying because equities always get it last and are susceptible to hope & hype. When last we left off, the subject was the food reward/palatability hypothesis of obesity and why I find it so unconvincing and problematic. This post is going to address that issue by first discussing three new papers published on the subject of sugar. Then I’m going to ask a lot of questions, hoping at least some of the answers will be obvious. All three papers are from Peter Havel and his collaborators at U.C. Davis and Vanderbilt; all three looked at the metabolic effect of the fructose-component of sugar, while one of them one also looked at the effect of sugar itself in the form of high fructose corn syrup (HFCS). It’s a little absurd to interview someone about an interview. But back in 1995, Robert X. Cringely landed a hell of an interview with a hell of a subject, at what was — in retrospect — a hell of a moment. Steve Jobs was just two years away from retaking the Chief Executive role at Apple and beginning a run that would transform the Cupertino, Calif.-based Mac maker from loser to leader in the digital economy. At the time of the interview Jobs was one such loser himself: his company, Next, was stumbling, and rival Bill Gates had taken Apple’s ideas and used them to sieze control of the personal computer industry. But Jobs was as cocky as ever. Jobs’ jabs at Microsoft which became part of Cringely’s PBS documentary ‘Triumph Of The Nerds,’ are now near legendary. His longer observations about making and remaking products — the stuff that didn’t make it into the original documentary — are even more interesting. Until recently those 70 minutes were lost. The interview had been shipped to Portland Oregon to be used in a sequel to the original documentary, ‘Triumph of the Nerds.’ They never arrived. But the documentary’s director, Paul Sen, hung on to a tape of the original Jobs interview. After Jobs death he rifled through his garage, found it, and “was reminded how good it was,” Cringely says. Cringely’s conversation with Jobs — now dubbed “Steve Jobs: The Lost Interview,” — will run, in its entirety, in select theaters next week. Convex and concave payoffs play a central role in the performance of many investment strategies. In considering a range of applications, including high and low beta stocks, options, levered ETFs, and hedge funds, the authors show how understanding these payoffs can have important consequences for understanding asset pricing and making investment decisions. The issue is simple: the U.S. government generally spends more than it brings in . . . and recently, a lot more. For years Congress was willing to serially raise the federal debt ceiling and monetize the deficit. But this past summer, some legislators balked. When the early August deadline for an increase in the ceiling arrived, our elected officials kicked the can down the road, but less far than usual. They created a Congressional supercommittee with unprecedented power to propose solutions, and they designed automatic spending cuts in case no proposal won approval. With the committee working under a November 23 deadline to find ways to reduce the federal deficit by $1 trillion-plus over the next decade, and with a presidential election less than a year away, the subject of taxes is all over the headlines and likely to remain there. Thus I’ve decided to provide a background piece on the issues. Bill Miller, the Legg Mason Inc. (LM) manager known for beating the Standard & Poor’s 500 Index for a record 15 years through 2005, will step down from his main fund after trailing the index for four of the past five years. Miller, 61, will be succeeded by Sam Peters as manager of Legg Mason Capital Management Value Trust (LMVTX) on April 30, the Baltimore-based firm said today in an e-mailed statement. Miller will remain chairman of the Legg Mason Capital Management unit while Peters will assume the role of chief investment officer. Miller, known for picking stocks he deems cheap based on financial yardsticks such as earnings, became mired in the worst slump of his career as he wagered heavily on financial stocks during the 2008 credit crisis. Value Trust lost 55 percent that year as the S&P 500 dropped 37 percent, including dividends, prompting a wave of withdrawals. The fund’s assets have plunged from a peak of $21 billion in 2007 to $2.8 billion as of Nov. 15, according to data compiled by Bloomberg. This experiment is one of my favorite studies mentioned in The Greatest Show on Earth. It also makes an appearance in Tim Harford’s book, Adapt. When evolutionary biologist John Endler began studying Trinidad's wild guppies in the 1970s, he was struck by the wide variation among guppies from different streams, even among guppies living in different parts of the same stream. Males from one pool sported vivid blue and orange splotches along their sides, while those further downstream carried only modest dots of color near their tails. Endler also observed differences in the distribution of guppy predators, and in the color and size of gravel in different stream locations. Endler photographed hundreds of guppies and carefully measured their size, color, and the size and placement of their spots. He began to see a strong correlation between where guppies lived in a particular stream and whether the fish were bright or drab. But what was responsible for these trends in coloration? And if bright colors made guppies more conspicuous to predators, why should males be colorful at all? To find out, Endler formed a hypothesis based on his observations, then set out to test it. His results would prove to be one of evolutionary biology's most important discoveries. We like to think that invention comes as a flash of insight, the equivalent of that sudden Archimedean displacement of bath water that occasioned one of the most famous Greek interjections, εὕρηκα. Then the inventor gets to rapidly translating a stunning discovery into a new product. Its mass appeal soon transforms the world, proving once again the power of a single, simple idea. But this story is a myth. The popular heroic narrative has almost nothing to do with the way modern invention (conceptual creation of a new product or process, sometimes accompanied by a prototypical design) and innovation (large-scale diffusion of commercially viable inventions) work. A closer examination reveals that many award-winning inventions are re-inventions. Most scientific or engineering discoveries would never become successful products without contributions from other scientists or engineers. Every major invention is the child of far-flung parents who may never meet. These contributions may be just as important as the original insight, but they will not attract public adulation. They will not be celebrated by media, and they will not be rewarded with Nobel prizes. We insist on celebrating lone heroic path-finders but even the most admired, and the most successful inventors are part of a more remarkable supply chain innovators who are largely ignored for the simpler mythology of one man or one eureka moment. John Mauldin: Where is the ECB Printing Press?